Bellman carts have traditionally been used for transporting luggage. However, luggage and bellman carts have since evolved into reliable multi-function utility carts that facilities inherently depend on for a variety of purposes. In practice, we have seen our bellman carts used to move equipment, materials, mail, boxes, supplies, groceries and much more. They have even made appearances in theater, TV, and movie productions, an unanticipated but welcomed addition to their growing use. Carts have two primary functions: They need to perform well and they need to look attractive in public places. Ordinary utility carts and platform trucks lack the visual appeal that bellman carts have. Because of this deficiency many facility managers concerned about appearance in public areas have searched for a solution and have proudly begun to use more attractive carts to perform simple more utilitarian tasks. What we learned from our customers is that a “crossover cart” was needed in the market and that accessorizing our Glaro Glider bellman carts with the three design features below was the solution that has met the market need. Adding one or two levels of shelves to select bellman carts enables users to conveniently transport a lot of small objects that traditionally do not fit into carts or are not contained well during transport. Even adding one shelf doubles the cart’s capacity for small packages. Glaro’s shelves are removable, and one or two levels of shelves can easily be added. This innovation is particularly useful in condos, where residents, guests, and staff use carts for varying purposes throughout the day. Adding capacity by employing a multi-level system makes carts a valuable time saving piece of equipment for use anywhere. For each shelf that is added, removable side containment rails are added as well. They ensure that items and materials remain on shelves during transport. 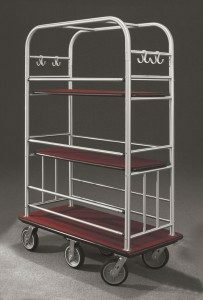 Glaro’s bellman carts come standard with side containment rails when shelves are included. Bellman and luggage carts used for utility purposes must be easy to clean. While Glaro Inc. carts come standard with carpet, coin design vinyl decking is increasingly in demand and can be substituted for a nominal cost. Coin design deck covering is the preferred choice in the healthcare industry because it is not only durable but easy to clean and sanitize. It is also a preferred surface for extremely heavy duty use indoors or out. 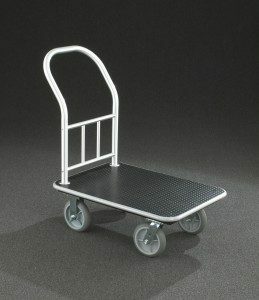 The Glaro Glider Platform Truck line is designed to match the quality and designer look of the bellman carts and is available with a choice of four deck coverings to meet every need; carpet, coin design vinyl, aluminum, and steel. Because of the demand for a highly functional, high capacity cart, Glaro Inc. developed its Glaro Glider Condo Cart. 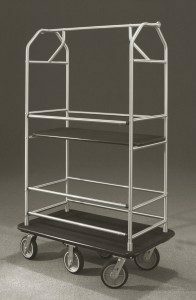 Four or six wheel carts come standard with shelving and side containment rails and they are offered in eight models each with a choice of finishes. They are recognized for their agility and their ability to handle a high capacity of small and large diversified items including luggage, shopping bags, clothes, golf clubs, sports equipment, audio-visual equipment, conference supplies, housekeeping supplies, and any packages that are transported in any type of facility. In sum, carts are not just for luggage. They have evolved into multi-functional, highly versatile carts that can be used for a range of purposes in hospitality, transportation terminals, educational, commercial, government, and even residential settings. Copyright 2019 Glaro, Inc. All Rights Reserved.